You’ll discover Downtown Ithaca in a major way by visiting The Commons, Ithaca’s award-winning center for commerce, attractions, entertainment, and so much more! Take a walk along The Commons to find a one-of-kind shopping experience, a variety of restaurants, historic architecture, and more! 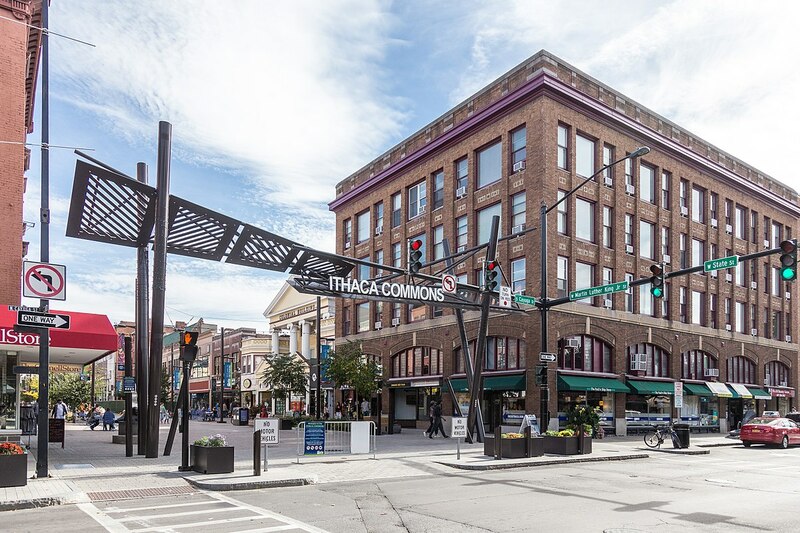 Located in the heart of Downtown Ithaca, The Commons is a unique four-block pedestrian shopping area jam packed with more than 100 independently owned and operated shops and boutiques, restaurants, art galleries, service providers, street vendors, and entertainers. At the west end, you’ll find brand name sporting gear at the Outdoor Store, handcrafted jewelry and gifts at 15 STEPS along with quality crafted decor and other specialty items at American Crafts by Robbie Dein along with various dining options such as Simeons and Monks on the Commons. In addition, the Commons is lined with some of the city’s most interesting and historic architectural facades, and features the beautifully designed Raimondo DeVincentis Water Fountain, the newly constructed Bernie Milton Pavilion, the Sagan Planet Walk, a playground, and Commons is truly the centerpiece of Ithaca’s engaging social and civic life. The Annual Great Downtown Ithaca Apple Harvest Festival by Presented Tompkins Trust Company is one of the region’s premier Fall Events. The Apple Harvest Festival hosts plenty of apples, local produce, fresh baked goods, family entertainment at every turn, games, rides, prizes and live performances on two stages. Apple Harvest Festival is a great introduction to the rich farm and artist community of Ithaca. 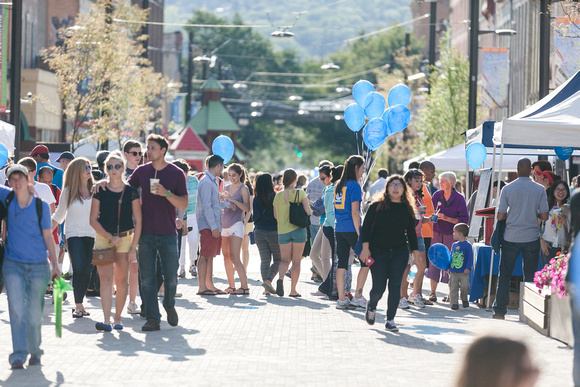 First time visitors can witness a variety of wonderful local entertainment while also visiting the historical outdoor pedestrian shopping mall, The Ithaca Commons. The pedestrian mall is the epicenter of the festival and the gateway to a nostalgic journey to harvest season fun. Ice Festival features impressive display sculptures, fire demonstrations, the ever-popular Ice Bar: an outdoor bar made entirely of ice, serving beer, wine, and hot cocoa, and, of course, Chowder Cook-Off! Witness the nation’s finest ice carvers as they compete for thousands of dollars in prizes during three rounds of breathtaking competition in Downtown Ithaca. Ice Festival goers can stay warm by sample over 20 different traditional, exotic, and gourmet chowders from local restaurants competing to be crowned our next Chowder Cup Champion! Sampling tickets are for sale in advance and on the day-of downtown. Ithaca Ice Festival ice carving competition is a National Ice Carving Association sanctioned event. The CFCU Summer Concert Series is a free outdoor concert series open to the public and held every Thursday evening the end of June through early September. This award-winning series features local and national acts performing music from various genres including jazz, blues, reggae, folk, hip-hop, pop, bluegrass, rock, and more! The Downtown Ithaca Summer Concert Series has become a weekly summer tradition in the local community; Ithacans and tourists alike enjoy happening upon a vibrant downtown on a weekday evening. See you on the Commons! Attendees can park in the Green or Seneca Street garages and walk to the Series. Parking is free in the garages after 8:00PM and free at street meters after 6:00PM. Both garages are equipped with accessible parking and elevators.Please contact the DIA office if you need special accommodation. Join us in Downtown Ithaca toward the end of January and end of July for the Winter and Summer Sale Weekends. Shops all over downtown with have sidewalk sales and discount racks or tables inside stores over the weekend! Look for Winter Sale or Summer Sale Weekend posters in storefront windows of participating stores to find great deals! Whether you’re looking for maps, sites to see, or events to attend, they’ve got you covered. Whether you need directions, help planning for a visit, information about the vibrant arts scene, or just need help finding your favorite shop, they’re the one stop for all things Ithaca. When you visit the Visitors Center in person, you’ll find friendly staff, plenty of brochures for local sites and venues, visitors guides, plus maps and information for most of the major performing arts organizations in Tompkins County. Special holiday hours may apply. Stop in or visit online at VisitIthaca.com or Ithacaevents.com. The Ithaca Science Center’s Sagan Planet Walk is a walkable scale model of the Solar system. The model scales the entire Solar system— planet size and distances between them —down to one five billionth of its actual size. Consisting of 11 obelisks situated along a 1.18 km (0.73 mi) path through the streets of downtown Ithaca, the Planet Walk leads from the sun at Center Ithaca to Pluto at the Ithaca Science Center. Taking this tour is a wonderful way to learn about science and explore downtown.